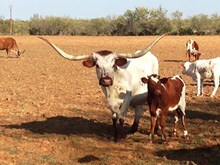 One of the great Longhorn cows! 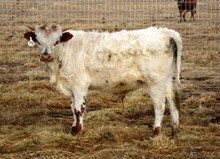 A multiple 70" plus producer out of the Starlight cow (longest horns in the breed for years). Consigned to the Fey Longhorns Ranch Sale and Social, June 8, Yamhill, OR.